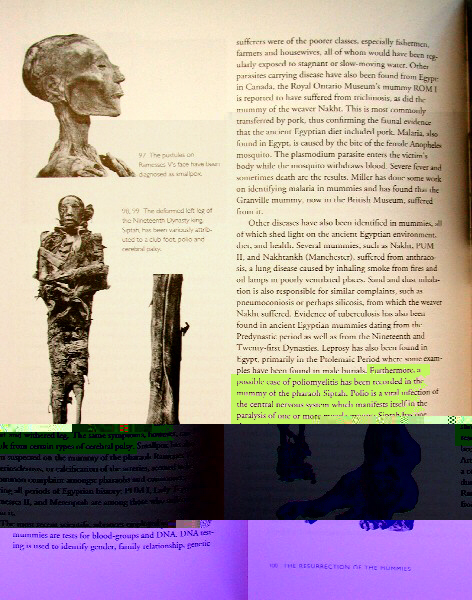 Furthermore, a possible case of poliomyelitis has been recorded in the mummy of the pharaoh Siptah. Polio is a viral infection of the central nervous system which manifests itself in the paralysis of one or more muscle groups. Siptah has one short and withered leg. The same symptoms, however, can result from certain types of cerebral palsy. 98,99 The deformed left leg of the Nineteenth Dynasty king, Siptah, has been variously attributed to a club foot, polio and cerebral palsy. "King Siptah was a Pharaoh who reigned at a somewhat later age, during the start of the 12th Century BC (19th Dynasty). Siptah was born in Egypt and his mother was Queen Twosre, widow of Amenmesse. When he was a boy, he was struck with a terrible disease. When he recovered he was left with a withered left leg and foot was rigidly extended like a horse’s hoof. Searching on the Internet on Siptah produced some very interesting information, although sometimes the dates differ. However, it appears that he reigned for only six years, dying at about 18, that his mother was co-regent and after his death became Mistress of Upper and Lower Egypt. King Siptah was buried in the Valley of the Kings and his tomb remained undisturbed until 1905 when the tomb was excavated."